It also features vibration reduction facilities (that’s what the VR stands for in it’s title). What that means is it has an optical element built into the lens barrel that adjusts as you’re taking the picture to compensate for camera shake. And because it’s built into the lens barrel itself, you’ll see the effect through the optical viewfinder and it can be very reassuring to suddenly see your view becoming very steady when you’re taking the picture. Because not only does it mean you can handhold exposures much slower than normal with this lens, but it also allows you to frame your shots a lot more accurately. Whereas on systems where the stabilization is built into the body, the view can sometimes get quite shaky at high magnifications when you’re actually looking through the viewfinder. 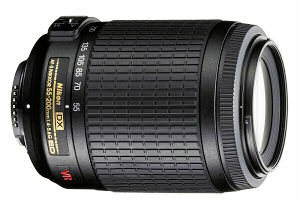 The Nikkor AF-S 55-200mm lens is also an AFS model which, in Nikon terminology means it’s got an SWM focusing motor. The focusing is very quick, quiet and built into the lens itself. The Nikon Nikkor DX VR 55-200 mm is great for portraits with the aperture all the way open and zoomed al the way in. Zoomed out to 55mm it can serve as your day-to-day walkaround lens. You can also get some reasonably close up pictures with it as well. It has a very flexible range to have at your disposal, especially when used in conjunction with a general-purpose kit lens. This is one of the best VR Nikkor lenses on the market today – it’s small, extremely light, quick and quiet. All in all it’s a pretty classy lens especially considering it’s an entry-level model. However, it’s not without it’s minor issues. When you have it zoomed all the way into 200mm and you have a close look into the corners you’ll see some slight blurring and color fringing. However in practice this is likely to not be too much of an issue since if you are using it zoomed all the way in, chances are you might be doing a portrait shot, sports photography or perhaps taking pictures of some wildlife. Typically in these types of shots the subject will most likely be in the center of the frame where this lens is perfectly sharp, and surrounding the subject is a nice blurry background anyway, hiding any optical weaknesses of the lens. So chances are you won’t even notice it. Also, since the Nikon Nikkor DX VR 55-200 mm f/4-5.6G is an entry-level lens the build quality is not as good as the top of the line Nikon lenses but there’s definitely nothing wrong with it. This is an incredibly light lens with no lens creep whatsoever, and compact, making it perfect for traveling. A great lens that comes with a pouch, lens hood and manual included. Highly recommended.